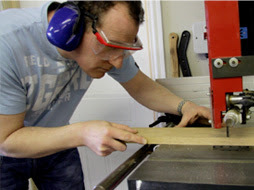 Matthew's Blog at Workshop Heaven: Win a 1 week course at the Peter Sefton Furniture School! Win a 1 week course at the Peter Sefton Furniture School! Peter Sefton runs a modern, fully independent Furniture School in the beautiful Worcestershire countryside. He describes himself as a facilitator, keen to ensure that students are shown the full range of methods, combining quality of design and productive making. The habitual selection of techniques that optimise safety, time, money and materials, along with the necessary skills and confidence to execute them correctly are the hallmarks of Peter’s graduates. There may be several ‘right ways’ of performing a task, but their training will help them to intuitively gravitate towards the one that suits them best without compromising results, whether they are making for pleasure or profit. Highly qualified in both handwork and machining, Peter demonstrates for Felder and has taught me a thing or two about hand tool techniques. He is a natural teacher, very approachable and richly experienced. The school itself is immaculate with plenty of natural light and a vibrant positive atmosphere. There are separate well equipped workshops for bench work and machining and bright comfortable classrooms for theory work and a student kitchen. We are offering customers the opportunity to win a 5 day course with Peter, just follow the link on the homepage of our website and pop your details down. Entry for the competition is free but not automatic so you do need to put your name down in order to be entered (even if you are already on our mailing list). Email addresses will be used by Peter Sefton Furniture School and Workshop Heaven for marketing purposes, they will not be shared, sold or divulged to any other parties. The winner will be drawn at the Peter Sefton Furniture School open day on 9th July 2011. Feel free to come along, we will be there demonstrating some sharpening and drilling techniques, along with Chris Eagles who will be demonstrating some turning techniques, and furniture maker Paul Hodgson will be doing a bit of chair making. Just to give you a taste for Peter's teaching style here's a little bit of video from a lecture on veneering. Peter Sefton Matching and Taping Veneers from Peter Sefton Furniture School on Vimeo.